Natural gas will overtake coal to become the leading source of electricity generation in the United States this year according to new projections released by the federal government. 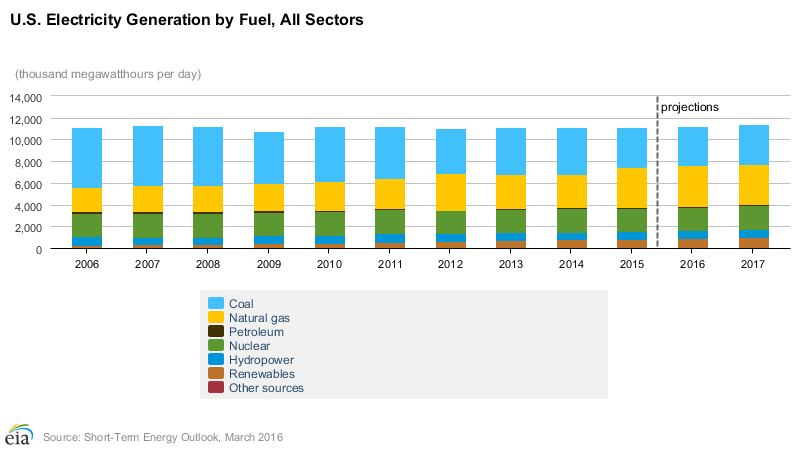 The U.S. Energy Information Administration’s (EIA) latest short-term outlook projects gas to account for 33 percent of electricity produced this year, compared with 32 percent for coal, which only a decade ago powered almost half the grid. “This will be the first time that natural gas provides more electricity generation than coal on an annual average basis,” the agency said. Surging domestic production in areas like the Marcellus and Utica Shale formations coupled with increased environmental regulations have prompted many power plants to switch from coal in favor of cleaner-burning natural gas. Gas-fired electric generation produces nearly half as much carbon dioxide as coal and is far more efficient according to the EIA. Our region is at the epicenter of the shale gas boom and new data released by the Ohio Department of Natural Resources indicates the industry has no signs of slowing down. According to the report, natural gas production grew by a jaw-dropping 110.6 percent from 2014 to 2015 to reach 953 billion cubic feet. It is clear that natural gas will play an increasingly important role in powering the grid. The affordable, clean-burning nature of natural gas makes this valuable domestic resource the preeminent option for states and utilities trying to balance the demand for low-cost energy with mounting air quality regulations. Developing safe and reliable transportation networks to deliver natural gas to market is essential to meeting the requirements of this changing market dynamic. Proposed energy infrastructure investments like the Rover Pipeline will ship natural gas to communities across our region, ensuring the benefits of this important resource are available to everyone.